WHAT WAS LEPROSY? We are inclined, as were early and medieval Christians, to assume that leprosy in our world is equivalent to the disease translated as “leprosy” in modern Bibles (sara’ath in Hebrew). 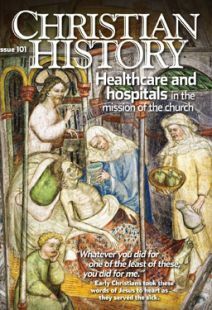 Though biblical leprosy was also some type of skin disease, it is not at all clear that it was the same disfiguring disease which began to be described as “lepra” or “elephantiasis” by Greek and Roman physicians in the first and second centuries. “Experts” have also told us that, as with biblical leprosy, medieval lepers were completely segregated from and despised by the rest of society. True, leprosy was often used as a metaphor for individual and communal sin, but the sin was seen as the much deeper problem. As historian Carole Rawcliffe comments, “There were, in fact, many leprosies: of bodies and souls, of saints and sinners, of men and metals, of animals and plants.” And though such famous figures as Francis of Assisi were terrified of lepers, the response of the church as a whole was not to cast these sufferers “outside the gates,” but rather to elevate them to special spiritual status. During the Middle Ages, lepers came to be seen as called by God to a life of meritorious suffering and prayer. Most people did believe that lepers were being punished for their sins (especially sins of the flesh), but they were not viewed as being beyond redemption or cut off from the life of the non-leprous. In fact, the purification they achieved through their suffering was seen as redeeming not only their own sins but also the sins of others, both living and dead. This was one reason wealthy people founded leper houses, since the inhabitants of the houses would be expected to pray for the founders’ souls. Francis, once he had recovered from his initial fear, came to love lepers and in fact started to live among them with his early followers, as a special way to be closer to God.